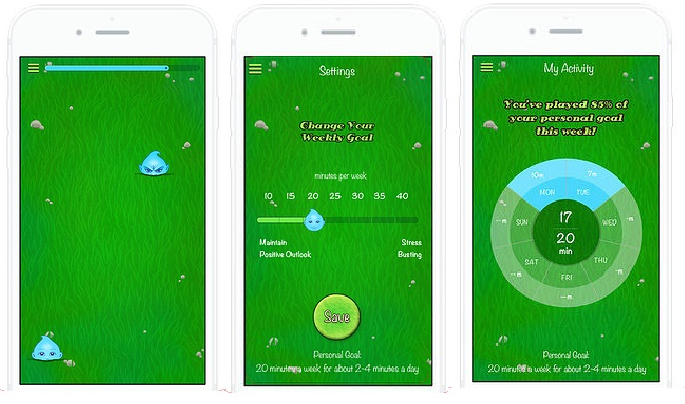 Personal Zen is a mobile game app aimed at reducing stress and increasing well-being in users. The game utilizes the attention bias modification (ABM) strategy. It includes positive- and negative-looking faces that pop-up on screen, which is followed by the movement of an object (e.g., grass) that users are required to act upon. The positive faces are relevant markers for the desired action location, whereas the negative faces are not. The Personal Zen developers report that brief use (5–10 minutes) can improve well-being, and continuous use (up to 40 minutes per week) can reduce stress. Personal Zen is a simple and easy-to-learn app. Although it targets an increase in well-being and stress reduction, the scientific mechanism of ABM utilized in this app differs at some extent from the mechanisms already studied and validated for efficiency before.